Taunus Tower – First Tower in Europe! 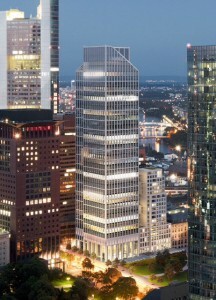 We are pleased to announce our first Tower in Europe to use the Eco Coat Glass Protection System which is now under construction in Frankfurt Germany. Temporary protection was spec’ed by the Architect and as plastic films no longer meet environmental standards the choice was to use our environmentally responsible polymer coating. Coating will be done in at the factory starting in October; each panel weighing about 1 metric tonne.